As we get older, it can often become difficult to look after ourselves as our mind and body become frailer. As a result, your elderly relatives will come to rely on you on a daily basis. And caring for your elderly relatives in this way can easily become a full-time job. Thankfully, you and your elderly relatives don’t have to struggle to get by. 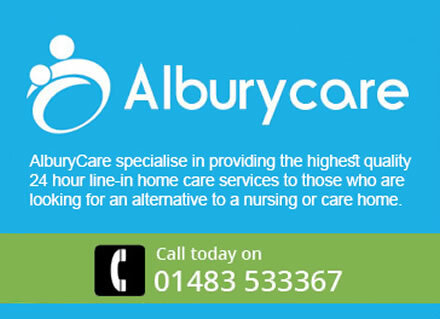 Albury Care offers live-in home care in the Guildford are for those looking for a better alternative to a nursing home. Our care service is also a great help for carers who are looking for some time off from their daily duties. What are the benefits of choosing Albury Care’s live-in home care services in Guildford? You and your family can enjoy the peace of mind that comes with knowing that your elderly relative is being looked after 24 hours a day. Your relative can stay at home in a familiar environment, surrounded by all their belongings. This can help them get through a difficult time. Support with everyday tasks, including washing, dressing, and laundry. Support patients in their day-to-day routines. Deal with advance conditions such as Multiple Sclerosis. Our company also prides itself on our core values, which help us ensure that every patient gets the care and support that they deserve. We are always working, no matter the time, to make sure that our patients are comfortable, healthy and happy. And this 24-hour work is made possible by living in with our patients. The team at Albury Care regularly check that their working methods and practices are constantly up to scratch so that patients always receive top-quality care and attention. To make sure we never miss anything, we have rigorous checks and monitoring routines in place to make sure that all our staff meet the grade. All of Albury Care’s nurses and support workers are also highly trained and respect the views of those who are in their care. The team of workers are incredibly professional in their work, but if there are ever any complaints or issues raised by clients or patients, we are quick to deal with them in a very sympathetic manner. Watching our relatives get older can be a very distressing time, and trying to care for the elderly ourselves can be a very stressful and unforgiving task. So there is no wonder why so many people are now looking for a care service that they can rely on and trust. Once you have a great care system in place, you can start to enjoy peace of mind again. That’s why so many families in the Guildford area now reach out to Albury Care for their live-in home care service.